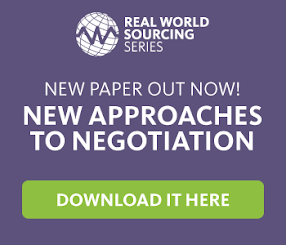 Strategic Sourcing: The Problem with Procurement – Is there really only one? A major roadblock that most public and private organisations face is the ability to measure and communicate procurement’s successes internally. If stakeholders don’t truly understand what procurement is doing, how can the function start to change perceptions? Only 27 per cent of those surveyed by PwC have an elevator pitch that properly explains the value procurement delivers. · Only 30 per cent of respondents ask suppliers for suggestions on how to improve organisation. They are overlooking a key opportunity for innovation, efficiency gains and savings. Suppliers have a perfect perspective to offer this type of guidance. By asking suppliers, “What can we do better?” they often suggest new alternatives you haven’t thought of previously. · Just 33 per cent share new opportunities, outside of current spend, with suppliers. Although you may be using a supplier for a particular good or service, they may have entirely different business units or offerings that procurement didn’t know existed. If procurement is already using a supplier and is happy with the work they’re doing, why not invite them to bid on additional work? I have often told our staff in Procurement that everyone in the corporation is an armchair quarterback when it comes to Supply Chain. They all are sure they know more about it than we do and that we simply need to put in orders and leave the thinking to them. I've shown them the strategy that we use and they've seen it work. We are finally starting to get some respect. It's still a battle but at least we aren't getting as much "friendly fire". We are pushing for our suppliers to be involved in New Product Development to build quality in and cost out. I've found that many are a little afraid that if the supplier finds better methods of doing things, it will make our development team look bad. Procurement's role is very important as they "touch" everythign in a company but company's need to treat their Procurement personnel as professionals to truly utilize their worth.